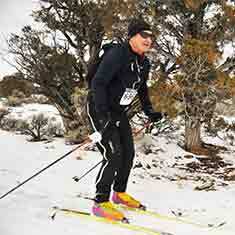 First contested in 1983, the Ely Outdoor Enthusiasts club bills its annual Bristlecone Birkebeiner Cross Country Ski Race in rural White Pine County as the longest running Nordic event contested in Nevada. 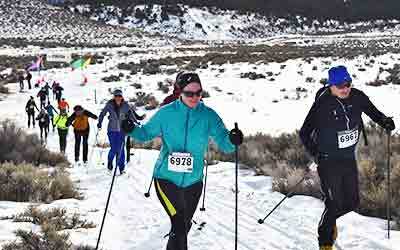 But the race is more than the Silver State’s oldest cross country ski race — it’s the only one. 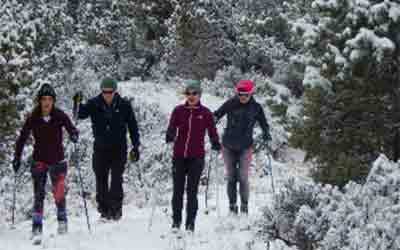 Located more than 300 miles from the renowned snow of Nevada’s east shore of Lake Tahoe, the Bureau of Land Management’s Ward Mountain Recreation Area in the shade of 10,941-foot Ward Mountain makes for an unlikely site of the state’s lone Nordic race. The looping Bristlecone Birkebeiner course traverses 4.1 miles through the sagebrush and pinyon-juniper forest that dominates the recreation area’s terrain. Although bristlecone pine are common in White Pine County and are certainly within eyeshot, skiers don’t pass through a grove of bristlecone. 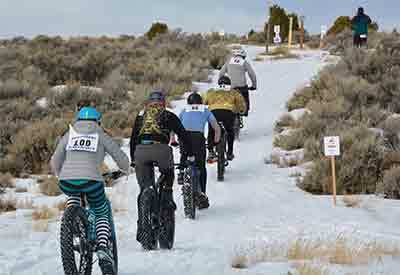 The race’s name is a homage to the hearty Nevada State Tree that thrives at high elevations and the Norwegian Birkebeiner 54-kilometer Ski Marathon that attracts 16,000 skiers annually, according to president of Ely Outdoor Enthusiasts, Nancy Herms. 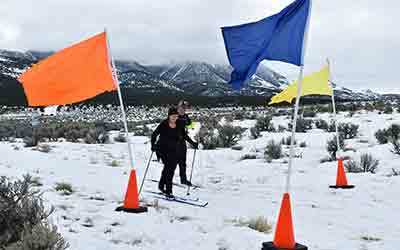 The BLM has given an official shout-out to both the name of the race and idea of skiing at the recreation area by officially naming the loop the Bristlecone Birkebeiner Trail. Despite Ward Mountain Recreation Area’s elevation of 7,400 feet, and the fact Ely’s average overnight winter low temperature of 11 degrees helps spare the city’s 50 inches of annual snowfall, race conditions for skiing can be sketchy. 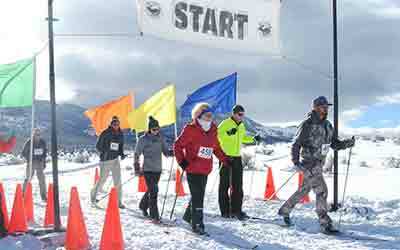 Participants in the ski race are forewarned about iffy snow depths and are instructed to bring trail running shoes along with their skis in case conditions are better suited for running. “We are concerned every year the skiers might sink right into the mud,” said Susan Keough, a manager at the downtown Ely Sportsworld sporting goods store that rents cross country skis to some of the racers. Although it’s fair to say the race dates to 1983, there was a long break in the contest from 1993 to 2014. During its decade-long run from 1983-1993, the race was organized by the White Pine Ski Club and held at Ward Mountain, usually attracting several dozen skiers. In low snow years, the race was moved to the snow atop nearby Cave Lake. A sign of the race’s popularity was the fact Budweiser was a sponsor of the event. 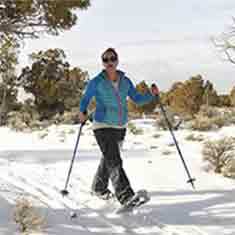 Yet snowfall and cross country skiing’s popularity both waned in White Pine County in the mid-1990s and the event disappeared from the local recreation schedule. Herms said the current version of the Bristlecone Birkebeiner began in 2014 when several members of the Ely Outdoor Enthusiasts agreed to revive the “Birkie” ski race and add it to the club’s list of organized footraces that year. Alas, with the reincarnated race on the club’s 2014 calendar, lack of snow forced the cancelation of the race. Finally in 2015, the race went off — with four skiers and one trail runner. The 2018 Birkie was especially precarious. The ground was entirely bare one day before the course coincidently — or miraculously — received a foot of fresh powder that allowed the race to go off as scheduled, with the skiers forced to break a new trail in the light fluff. This year, last month, all of the Bristlecone Birkebeiner variables — most importantly, a solid snow base — aligned and the race drew a record number of about 40 participants. Previously contested later in the winter, the Birkie was added to Ely’s Fire and Ice Winter Festival’s schedule and two new winter disciplines — fat tire mountain biking and snowshoeing — were contested in the Birkie. The Fire and Ice Festival is a two-day celebration of White Pine’s winter activities, including firework displays, special Northern Nevada Railroad rides and an ice sculpture contest at Cave Lake. At the start of the ski race, there was no chatter between the entrants about fluorocarbon waxes or pole lengths or boot stiffness. Any mention of skating — a popular form of cross country skiing in which skiers propel themselves with a skating motion — was a nonstarter and reserved for Cave Lake in ice skates after an early hard freeze. There were some faint remains of a set classic track from a snowmobile a few days prior, but those tracks were quickly chewed up by the fat-tire cyclists warming up for their event. Judging from some of the gear present at the starting line, Sierra Nevada longboarders of the 1880s might have felt right at home. It was pretty apparent that every set of waxless 1960s-era Jarvinen, Alpina and Karhu skis ever purchased in the county had escaped the corner of the garage for at least a few sprightly hours. The entrants favored no-nonsense ski jackets and pants over the spandex clothing so popular with that distant Tahoe crowd. Finally, the pack was off from the starting line near the parking lot and quickly split long before the trail disappeared into the pinyons and junipers. There were no elbows swung among competitors aiming to gain position but rather cordial cooperation as the skiers angled to find some space for an efficient kick-and-glide in the sometimes obscured classic tracks. 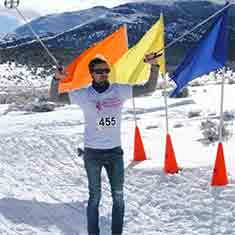 After a full circumference of the Bristlecone Birkebeiner trail’s 4.1 miles past countless junipers and pinyons and up-and-down several moderate hills, skiers crossed a resplendent finish line featuring colorful flags that nicely contrasted the snow and sage. A warming camp fire and a food truck ladling out soup for skiers were just a few yards away. For a moment, the ski trails of Norway couldn’t have surpassed those of White Pine County. Andy Bath, 36, a local pharmacist, was the first finisher in the race. Amazingly enough, Bath, a lifelong resident of Ely, had skied in the original version of the Birkebeiner in elementary school. Also amazing was the fact he had not skied since last year’s Birkie. For information on upcoming Ely Outdoor Enthusiasts events, visit www.ElyOutdoorEnthusiasts.org. For information on the 2020 Fire and Ice Winter Festival, visit www.ElyNevada.net.